Have you just signed a major solar supply deal or landed a major customer? Or perhaps you are a polysilicon supplier who has just extracted an equity interest from your take or pay customer, and you want to show your appreciation? 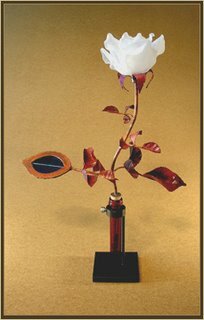 SUNBROTHERS (http://www.sunbrothers.com/) creates solar powered sculptures from copper, bronze, and hand blown glass. Solar cells and LEDs are designed into the leaves and flowers respectively. By day, sunlight charges batteries inside the sculpture, and, at night, the glass flowers glow and change color. I’m working on Long Stem Roses for the holidays. I also will be making a few tulips on commission, and developing the next version of my vining sweet pea design. Long Stem Roses were featured during the Solar Power 2006 Networking Reception at The Tech Museum of Innovation sponsored by PowerLight Corporation. Long Stem Roses can be varied by the LED color and list for a reasonable $250 to $400. Corporate marketing and marketing communications folks are always on the lookout for unique gifts. Here’s a special gift (think Neiman Marcus) not from the same old, lame marketing gift catalog. Bonus: two speech video bites (on YouTube) from the PowerLight sponsored reception.